While Making Your Property more Valuable and Beautiful too! Get the backyard privacy you want and enjoy your home and garden more. If you like an open space, or a more intimate feel of outdoor rooms try these suggestions to get the added privacy you need. The picture above shows our secret garden at our back fence line. 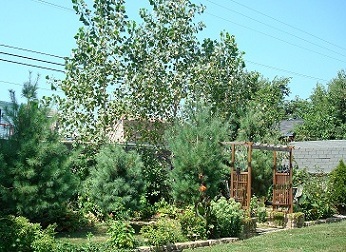 The trees are fast growing and give us the backyard privacy we seek from that direction. The view is also much better than it was before we made this area. New homes in subdivisions are getting built closer and closer together all the time. Older subdivisions have larger backyards but the need for privacy still exists. Even homes out in the country can have a lack of privacy from roadways. Corner lots are very open to the street. You can achieve the desired privacy you need in these ways. 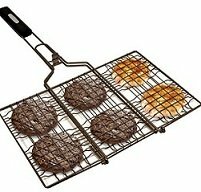 And while doing so you will improve your home and garden. You can build privacy fences, plant trees and shrubs, and plant vines but the placement is important to have the look you want and the backyard privacy needed. Consider fencing for added security and better protection for you children or pets. 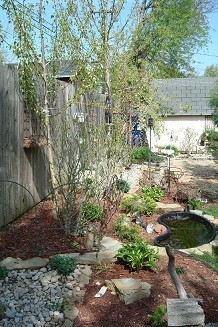 Fencing can be a back drop for plants and trees for a more natural look. If space permits you can do much more than just planting a straight row of trees or shrubbery. Read on to find out how to place your plantings for a pleasing look. First you begin by determining your actual privacy issues. Do you need privacy on just one side? Or do you seek privacy on two sides or all the way around? Determining the amount of privacy you need also helps in deciding how to arrange your plants and the type of plants to use in your landscape design. The picture below shows our fence line after we planted some fast growing hybrid popular trees to hide a less than attractive view behind our privacy fence. We turned this area into our secret garden. The photo below was taken in the spring. During summer months now the view is about 85 percent blocked. The picture below shows the same fence area in mid summer. As you can tell from the picture we have alot of trees and bushes and flowers planted in the area. The idea is that the 4 white pines will eventually grow tall enough that we will remove the lower branches so they don't hang to low for us to use the space. The white pines are evergreens so they will provide year round privacy to the backyard. Starting with the lowest growing plants at the front layer closest to your patio area or setting area. Keep the lowest growing, smaller plants closest to the area you want to make private without having them grow into or hang over the space. This will provide a secluded, more private feeling when sitting without feeling to closed in. Determine if you want year round backyard privacy or seasonal. Remember some plants lose their leaves in cold months and the space will be less private. Also some plants are flowering which attract birds, bees and other insects. The most important place to start is close to the patio area, with an immediate layer of plants or shrubs. 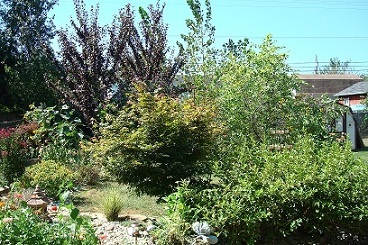 The middle layer and outer layer of plants can contain a combination of trees , bushes and shrubs. Use a combination that blends well together. If the first layer closest to your patio or setting area loses their leave at the end of the warm season, just make sure that you have some evergreens mixed in the middle and outer layers for year round privacy. Together the effect will get the job done and not feel as closed in as the effect would be with all evergreens. When you sit on the patio the layers of plants work together to overlap and create the private environment you desire. This will give a well landscaped look to the individual areas and achieve the goal of plenty of backyard privacy. 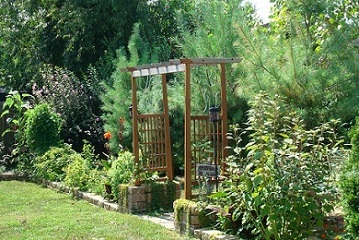 You can build pergolas and grow climbing vines over them for added beauty and even more privacy. You will have to spend time creating the layered look for privacy but the overall effect will be very pleasing. You will have a backyard that is private and one that you can show off with pride. 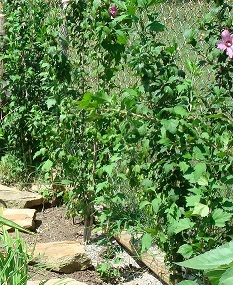 The picture below is of our new Rose of Sharon bushes we planted this spring at our chain link fence. These were started from sprouts from other rose of sharon bushes we have in other areas of our backyard. I have mentioned before that we live in a subdivision and the property already had fencing when we bought it. The backyard is large and one side has chain link fence and the back and other side have wooden privacy fence. There was a lack of backyard privacy even with the fencing, because our property is lower than two of the surrounding properties. We have worked on our backyard each year since I arrived. My husband had already made several changes before I moved in. He had removed 2 large trees because there was an above ground pool and the leaves were falling in the pool and creating alot of cleanup. So the backyard was very open at that point. Plus there was no shade. After having the pool removed early one spring ( that is another story in itself)! we have redesigned the entire backyard. It is still a work in progress. We do the projects in stages. By doing the projects over a long period of time we are able to take the opportunity to determine what our real needs - are within the space we are working on. And yes, we have enough time to change ideas, scrap projects and come up with even more ideas this way. We usually sit in a part of the yard and look at the space we are going to work on We use this space as a THINK TANK. This is fun to do and provides us with outdoor time together. That is always a good thing. Sitting around the fire pit and grilling hotdogs is another way of enjoying talking about a project. Anyway, over the years we have placed trees and shrubs in various locations in the yard, close to the patio, and at the back fence and in areas between. Plants are not in rows except at the fence line. Even there they are broken up by a variety of species. Now when we sit on our patio when all of the plants and trees are leaved out, we cannot see or be seen by our neighbors. Each year I plant a climbing vine on an arbor, I let climbing vines grow up the deck posts and onto the deck sides and this also helps create more privacy in the backyard and patio area. Some plants are cut back at the end of the season. 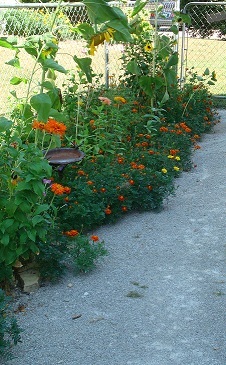 There are also lots of perennials and annuals planted in the yard. To create more backyard privacy we used a combination of evergreens and flowering plants to get the look we wanted. I do like to see the entire yard in colder months, when it is not in use, so by doing this I can see thru the plants. Our backyard is like a series of outdoor rooms, we have a secret garden, a patio area, a upper deck, a space under the deck, a vegetable garden, a firepit area and some open areas as well. We also have a garden shed. There is still plenty of room for the dogs to run and play. The secure fencing makes sure that they are always safe and enclosed in the backyard. This year we added the vegetable garden and moved a section of fence forward to incorporate our unused side yard into our backyard space. For added backyard privacy in this (New) area we planted a row of Rose of Sharon bushes close to the chain link fence.I also planted a variety of flowers in front of the bushes. The bushes and the vegetable garden gave us alot of added privacy. You can achieve a very pleasing look and get the backyard privacy you need by doing everything in stages. And without spending a fortune, when you do it yourself. The work is worth the effect because you get to enjoy your backyard without being subjected to intrusions of other people. You will spend more time outdoors. And remember a nice landscape also increases the value of your property. Share your thought about backyard privacy below. 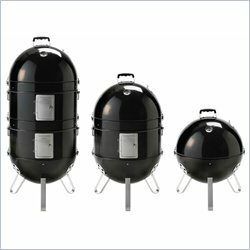 Check out the resources below past the invitation to tell us your story,for money saving offers on items you will need to enjoy you backyard privacy even more! OR INSPIRING, OR IF YOU DISLIKE IT COMPLETELY, I WANT TO HEAR FROM YOU!